With a full wrap, the color of the vehicle does not matter, your fleet can still look uniform. One of our customers with signature red vehicles, no longer has to paint them before they can be put to use. On a lot of commercial vans we block out the rear windows, preventing others from peeping inside. While you should still keep a wrap clean, they will still appear cleaner then solid color vehicles. Often times you will not even notice that they need to be cleaned. Clean cut logo, Vinyl graphics are no longer state-of-the-art. Clean cut graphics no longer give the same professional image that once stood out. Now you need a Full color wrap to not to look outdated. A full car wrap typically covers the entire vehicle excluding or somethimes including the roof. Graphic Design time usually takes between 4 & 14 days, depending on complexity and changes. Our Vehicle Wrap Experienced Designers will create for you a Professional – Attention Getting – Effective graphic design. We can help you out, even if you have no idea where to start. What you see is what you get. We will E-mail you a layout and you can come in and see what your vehicle will look like before we wrap it. Then, we perform a thorough inspection of your car wraps. 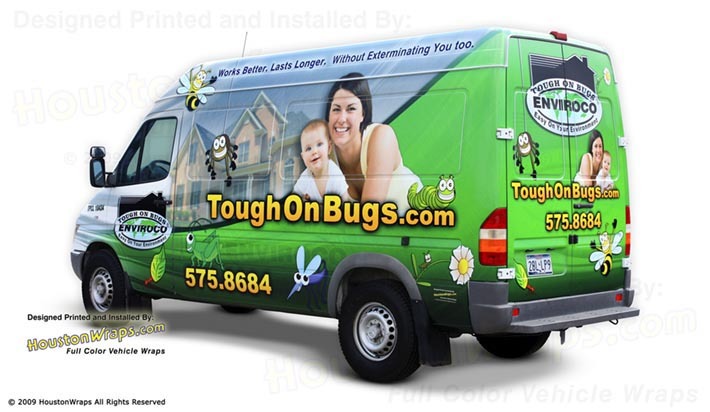 Some or our compettitors state they can do van wraps in 8 hours. We Pledge NOT to get your wrap done in under 8 hours!!!! It takes us 8 hours just to clean and prepare a van for the vehicle wrap installation. With proper care your car wrap will last (and still look good) for 5-7 years. If any of these components are lacking your wrap will not achieve its full effectiveness. Compare our designs with our competitors. Most other wraps are ineffective… they are like TV commercials where you cannot remember who the company was or what they were selling. Most wraps look more like they belong in an art car parade and have little to no marketing value. We’ve been doing vehicle wraps since the beginning… over 15 years. For more vehicle wrap information check out www.HoustonWraps.com! State-of-the-art high resolution, full hard solvent ink printers. Full hard solvent inks give the brightest color and longest durability (fade resistance). This is the tried-and-true, time tested system that works; don’t let anyone tell you differently. This gives the longest lasting UV protection and scratch resistance against outside elements. Premium 3M® IJ-180C Vinyl is the state-of-the-art material for vehicle wraps. Full wrap will protect your factory paint job; in effect freezing your paint in time, so no fading will occur. Your vehicle will also have 4 millimeters of protection around it, blocking small rocks and other debris. With a full wrap, the color of the vehicle does not matter, your fleet can still look uniform. One of our customers with signature red vehicles, no longer has to paint them before they can be put to use. On a lot of commercial vans we block out the rear windows, preventing others from peeping inside. While you should still keep a wrap clean, they will still appear cleaner then solid color vehicles. Often times you will not even notice that they need to be cleaned.